FlyVPN is easy to use, but overpriced and way too slow over long distances. The free plan might still be handy, as long as you don't mind the session logging policy. Editor's note: Because of privacy and security concerns, we have pulled down the link associated with FlyVPN. Here are the best VPNs of 2017. While some VPNs try to specialise in a particular area of the security market, FlyVPN takes a simpler approach, piling on the features to try and win absolutely everyone. There's site unblocking, for instance, maybe including Netflix (this changes constantly, so don't rely on it). Hundreds of servers in 40+ countries. Native clients. Desktop and mobile support. Not to mention multiple protocols, and unlimited traffic. No money? There's a free plan. This only gives access to some of the servers for a maximum of three sessions per day, but that's enough to be useful, and a simple way to try out the full service. If you decide to subscribe, there are three plans: a regular shared IP account, or dedicated IPs in the USA or Korea. Pricing is the same for each, at $9.99 (£8.20, AU$13.30) for a single month, dropping to $6.67 (£5.50, AU$8.90) monthly if you pay for a full year. If that seems a little expensive, keep reading. If you want to support, say, three simultaneous connections, you must buy three plans all at the regular price. Uh, okay. The company does at least offer a no-risk 30-day guarantee if it all goes wrong, though beware – this only applies to PayPal. Keep that in mind if you sign up. FlyVPN's terms of service and privacy policies score highly for simplicity at only 800 words. That's less than 20% of some of the more wordy competition. The document provides some interesting details, too, even if they're not always what we want to hear. FlyVPN doesn't log your internet traffic, for instance, but it does collect session data including your local IP, the time you connected, the VPN IP and port you were given, and the time you disconnected. There's no information on how long FlyVPN keeps this session information, but it claims this is intended to allow investigation if it's believed a "violation of DMCA or SPAM policy occurs", so presumably we're talking more than a few days. The ‘VPN Use Policy’ is mostly saying you're not allowed to do evil things while connected, but it also explains that only the servers in China support P2P. The refund policy seems to be the highlight. It only applies to PayPal and you must send an email to get it, but you have a generous 30 days to do so, and there are no apparent restrictions on the bandwidth you might have used. FlyVPN's setup was easy. Within a minute or two we had installed the Windows client, created an account, and were looking at a list of servers, along with their ping times and estimated load. Our short-hop UK-UK performance test* delivered acceptable results. Download speeds were around 60% of what we’d normally see – still a very usable 24Mbps – and even the free account gave as around 14Mbps. Our UK-California speed tests were very, very different. Download speeds fell to a snail-like 2Mbps, upload speeds under 1Mbps; virtually unusable for even basic browsing. We switched to the fastest US server as reported by FlyVPN's client, which was much closer (New Jersey), and this gave us average download speeds of around 15Mbps. That's more reasonable, but bear in mind it's likely to the best the network could manage, and it still couldn't get close to our non-VPN speeds around the same time (38Mbps). 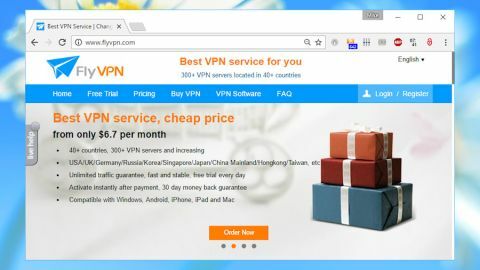 FlyVPN markets itself well, is easy to set up and use, and its free plan might be good enough for very undemanding users. But the paid product is overpriced and horribly slow over long distances, and the session logging policy makes us nervous, too. Give it a miss.